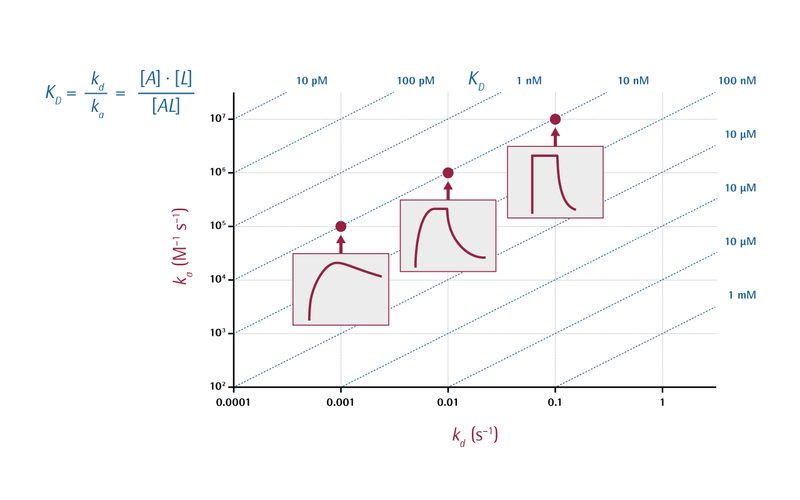 When investigating molecular interactions, equilibrium dissociation constants (KD) are commonly used as a measure of the affinity of two molecules for each other. In other words, the KD is a direct measure of the strength of an interaction. Determining the KD is very important to evaluate the biological relevance of an interaction, such as in the study of fusion proteins, DNA-protein binding and for standard protein analysis. Fig. 1: Sensorgram of a typical surface plasmon resonance (SPR) measurement. One of the interactants is immobilized on the sensor surface, while the others are free in solution and pass over the surface. 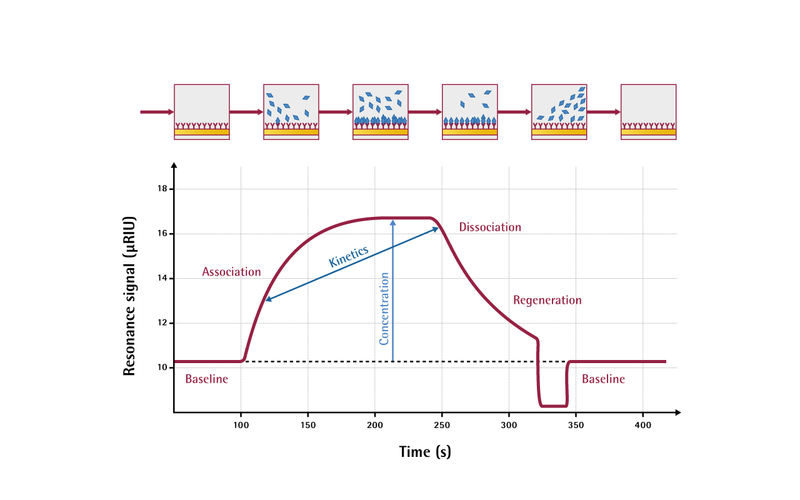 A typical cycle of measurement contains association, steady-state and dissociation phases, eventually followed by regeneration; these phases are displayed in the sensorgram. However, obtaining only a KD value does not provide independent information on the kinetics of the molecular interaction. In other words, KD does not tell you how quickly the two molecules bind (i.e., the association rate constant or "on-rate" of the interaction), or how quickly the molecules dissociate (i.e., the dissociation rate constant or "off-rate" of the interaction). Indeed, molecular interactions that have the same KD can have widely different on- and off-rates (Fig. 2). Fig. 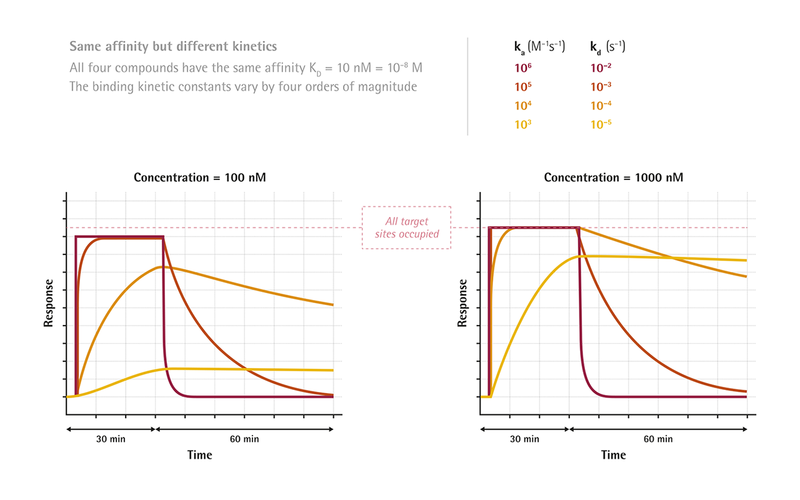 2: Comparison of 4 different compounds with same affinity but different kinetics. The kinetics of a molecular interaction are very important for drug discovery and development1, 2, 3, 4. The off-rate is especially important, because it tells you how long the compound binds to the ligand or target. A low off-rate would mean the drug could be formulated for less frequent dosing, whereas a high off-rate might require multiples doses per day. Given how important patient compliance is for treating many diseases—such as chronic diseases5 and acute infections—ensuring a compound can be used in a convenient dosage regimen is vital to drug development. Many studies have shown that patients are less likely to miss a dose when they are taking a drug once a day compared with twice a day, and a once-weekly dose results in even better compliance. Kinetic data can also help reveal a compound's mechanism of action6, 7, 8 by determining whether the compound is interacting with, for example, one or multiple binding sites on the target9. This information is important for a number of reasons. For example, while most enzyme targets have a unique active site, they typically share other structural features with other enzymes. Interacting with such an allosteric site10 could lead to unwanted reactions with other enzymes. Alternatively, a researcher might be looking for an allosteric interaction to activate or modulate the target. Select protein-interacting therapeutic candidates according to their on/off-rates and not only by their affinity values. Identify potential drug targets and diagnostic markers in the early stages of pharmaceutical/biological research. Elucidate disease and cell mechanisms by characterizing protein interactions. Select the best antibodies as research tools, assay components or therapeutics by fully defining their interaction behavior. Develop assays to characterize proteins in drug development - with fragments, low-molecular-weight compounds, peptides, DNA, or other proteins. Detect and characterize immune responses during preclinical and clinical development. Characterize protein therapeutics and implement methods for quality control and quality management. No other biophysical technique provides such comprehensive information in real time in only one system. We hope you found this white paper helpful and informative. You can read more about SPR instrument hardware and sensor chips elsewhere on XanTec's website. If you would like advice on how to best determine equilibrium constants and association and dissociation rate constants, please do not hesitate to contact us. Also, please contact us if you would like to suggest topics for future white papers, or if you have any suggestions to make our white papers even better. Kersh, Gilbert J., et al. "High-and low-potency ligands with similar affinities for the TCR: the importance of kinetics in TCR signaling." Immunity 9.6 (1998): 817-826. Kuang, Ming, et al. "Binding Kinetics versus Affinities in BRD4 Inhibition." Journal of chemical information and modeling 55.9 (2015): 1926-1935. Guo, Dong, Laura H. Heitman, and Adriaan P. IJzerman. "The role of target binding kinetics in drug discovery." ChemMedChem 10.11 (2015): 1793-1796. C Swinney, David, et al. "The role of binding kinetics in GPCR drug discovery." Current topics in medicinal chemistry 15.24 (2015): 2504-2522. Glossop, Paul A., et al. "Inhalation by design: novel tertiary amine muscarinic m3 receptor antagonists with slow off-rate binding kinetics for inhaled once-daily treatment of chronic obstructive pulmonary disease." Journal of medicinal chemistry 54.19 (2011): 6888-6904. Pan, Albert C., et al. "Molecular determinants of drug–receptor binding kinetics." Drug discovery today 18.13 (2013): 667-673. Copeland, Robert A., David L. Pompliano, and Thomas D. Meek. "Drug–target residence time and its implications for lead optimization." Nature reviews Drug discovery 5.9 (2006): 730-739. Schneider, Elisabeth V., et al. "Structure–kinetic relationship study of CDK8/CycC specific compounds." Proceedings of the National Academy of Sciences 110.20 (2013): 8081-8086. Pargellis, Christopher, et al. "Inhibition of p38 MAP kinase by utilizing a novel allosteric binding site." Nature Structural & Molecular Biology 9.4 (2002): 268-272. Regan, John, et al. "The kinetics of binding to p38MAP kinase by analogues of BIRB 796." Bioorganic & medicinal chemistry letters 13.18 (2003): 3101-3104.